The Creative Potential is the go-to resource for the insider scoop on how to successfully build your creative business online. Whether you are an emerging designer, creative business owner, artisan or looking to turn your side hustle into a full time gig-our goal is to arm you with information that is essential to starting your business. Here, you are part of a community of budding creators, innovators and business executives who are motivated by the idea that one day, your brand can one day be a household name. Your business aspirations become ours; our goal being to transform those aspirations to tangible goals that you feel are within reach. From product development to merchandising and sales to branding and public relations, our expertise covers the spectrum of careers within the fashion and consumer goods industry. Our no-holds barred approach means that you receive genuine, honest advice from the perspective of having been there ourselves. No smoke and mirrors here trying to teach you something that we know nothing about! Through our site, blog, online workshops and courses, we’ll share tips for successfully launching your brand online and offline and what to expect once you are there. We’ll offer suggestions for fine-tuning to truly unleash your potential – whether that be better articulating your goals and vision to finding what is the best strategy for your brand. You’ll have access to expert advice from movers and shakers in the industry; learn about best practices for building and evolving your brand; and tap into a collection of tools, templates and resources that are essential building blocks for operating your business. Founder Melissa McGraw is a 20-year veteran of the fashion and consumer goods industry. Having worked with mega giant e-tailer Amazon.com Melissa understands the complexities of both brick-and-mortar and e-commerce retail models. In fact she has written content and analyzed/reviewed SEO tactics for over 80,000 items that are currently sold on Amazon today. And, as an adjunct professor in e-commerce and logistics at the Fashion Institute of Technology in New York City, she has her finger on the pulse of e-commerce trends and practices for creative businesses. Deep down I think my father always knew I would be an entrepreneur. He asked me over breakfast one morning shortly before his passing if I remembered creating a side hustle (for him and myself) when I was just eight years old. I honestly didn’t. How could have I completely forgotten spending countless hours making ribbon barrettes and taking phone orders at night for my friends, classmates, and local Girl Scout troops? I remembered how excited I was to get home from school and make barrettes. The feeling of accomplishment when I made a sale and distributed the barrettes to their owner. The pride when seeing my designs pass by me in the hallway at school. But that business soon faded away as I discovered other interests, and followed the path my parents instructed me to take. I studied hard, went to college, and got a job right after graduation. This girl from a small town in Pennsylvania found herself quickly immersed in the exciting fashion industry in New York City. I got to travel the world many times over, and build brands for celebrities and designers. As the years passed, the excitement faded. I was burnt out and knew I had to create something of my own. I decided in 2010 that I was going to immerse myself in e-commerce. I was told it was the wave of the future and I had to jump on it. I became a copywriter and wrote content for over 80,000 items featured on Amazon today. I also launched two websites Workchic and The Fashion Potential, all the while making every rookie entrepreneur mistake along the way. And boy were there a lot of mistakes! I quickly realized I didn’t have the resources I needed in place to successfully build my business. I was lost and needed direction. But passion kept me moving forward. I didn’t give up when those self-doubt thoughts crept into my head. I just knew my passion became deeper for helping other creative entrepreneurs. The Creative Potential evolved as a go-to resource on how to balance an entrepreneur’s dreamy creative side with practical, action steps on how to build their business no matter what product they sell or what service they provide. In addition to teaching hundreds of fellow creative entrepreneurs, you can find being an adjunct professor at FIT in New York City, writing copy for Amazon, training for my first 5K race, bingeing on Netflix, and spending quality time with my husband and 17-year-old cat, Puccini. I am so glad you decided to stop by and I hope you find The Creative Potential super helpful, whether it's through one of our blog posts, newsletters, webinars, online courses, or an item from the Toolkit. 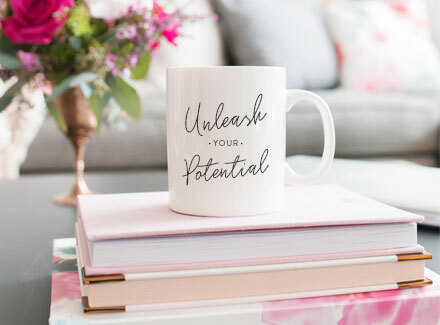 You have so got this-cheers to your creative business success!